In the beginning there was only one logo — The Logo. The iconic white silhouette of Lakers all-world guard Jerry West dribbling between pillars of blue and red adorned the left shoulder of every NBA jersey and the outside ankle of every NBA sock for decades. In time, league executives acted as the proverbial Little Dutch Boy, a callow finger jammed into the dam with a tide of sponsorship deals on the other side, bent on filling every untouched inch of shirts, shoes, sweatbands, and warm-ups with a financial deluge of visible ads. The first crack came in the form of a one-day deal to have a brand sponsor Jerry’s spot on the shoulder during the 2017 All-Star game, and now the crack has spread with a new deal that will make Stance socks the first outside logo worn by every NBA player. On Monday, the NBA announced its partnership with the brand, known for its novelty of bright colors and loud imagery, which will solidify it as the Association’s official on-court sock. They’ll create a specific look for each team to match their colors, and add themed socks for special events, including Christmas, St. Patrick’s, and Martin Luther King Day games. That means the Stance logo (and not that of Nike, Adidas, Reebok or any other iconic brand that existed before 2009) is going to be the first to have its emblem stamped on a licensed piece of league equipment. 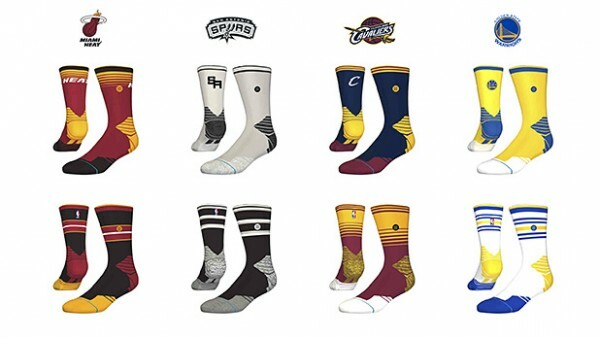 Of course, the NBA justifies the exception to its traditional ethos of sponsor- and logo-free uniforms by considering the sock an accessory — not part of the actual “uniform” (despite a league requirement of the sock being the very definition of the word). It is comparable to the presence of the massive Spalding logo on the basketball, or the symbols on whichever new shoe a player may be launching. Speaking of which, don’t be surprised by the fact that four players have already been announced as brand ambassadors for the Stance partnership. Golden State Warriors All-Star Klay Thompson, who helped lead the Warriors to the best regular season record in franchise history, three-time champ and Miami Heat guard Dwyane Wade, Detroit Pistons center Andre Drummond, and Dallas Mavericks forward Chandler Parsons round out the inaugural group of sponsored athletes. That the official deal is with a clothing brand that specializes in the apparel that they are actually sponsoring means that as the inevitable happens (ie. business transactions), more brands that have a stake in the gear and apparel they are sponsoring can help contribute to NBA Commissioner Adam Silver’s goal of “figuring out the right economic model” for sponsorship. This keeps the idea of McDonald’s putting their Arches on a moisture-wicking, targeted-compression anything at bay for now, but it still keeps that possibility in the ballpark, in large part due to successful jersey deals by English Premiere League teams. It might also blow open the negotiating floodgates after Adidas announced in March that it wouldn’t pursue a partnership extension with the NBA, and will instead allow their jersey deal to expire at the end of the season. Now this new precedent by stance makes it possible for Michael Jordan’s Jumpman brand, Adidas’s rumored heir apparent, to argue for a similar amount of space on the chest of players for decades to come. Fitting that basketball’s G.O.A.T. might soon live next to Jerry on the shirt of every NBA player. Certainly more fitting than a pair of Golden Arches.